February 19 is shaping up to be a very busy day for satire. Aside from “After Charlie: What’s next for art, satire, and censorship?” with art spiegelman, Molly Crabapple, Francoise Mouly, and Emmanuel Letouzé in New York City, our friends at the Cartoon Art Museum in San Francisco will be presenting “Slinging Satire,” a panel discussion featuring Matt Bors, Mark Fiore, and Tom Tomorrow! The panel takes place at 7:00 p.m. at the Cartoon Art Museum (655 Mission St, San Francisco, California 94105), and CBLDF members who present their current member cards at the door will be charged half the cover price! 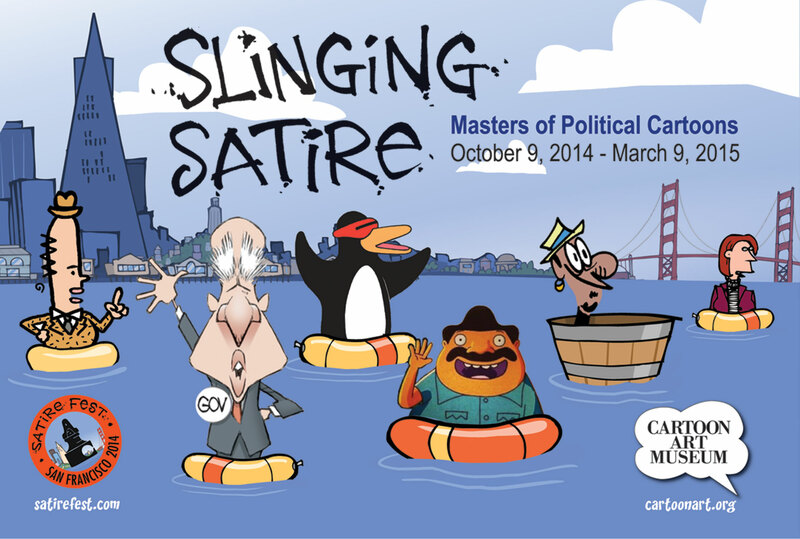 Please join the Cartoon Art Museum on Thursday, February 19, 2015 for a panel discussion and booksigning in conjunction with current exhibition Slinging Satire: Masters of Political Cartoons. Matt Bors, Mark Fiore and Tom Tomorrow will discuss their work and the role of political satire. The discussion will begin at 7:00pm followed by Q & A. A booksigning will follow the panel discussion. Matt Bors is a nationally syndicated editorial cartoonist and was the recipient of the 2012 Herblock Prize. Tom Tomorrow is the creator of the weekly political cartoon This Modern World, and was the 2013 recipient of the Herblock Prize. The panel discussion will be lead by Pulitzer Prize-winning cartoonist and animator Mark Fiore, whose work has appeared on SFgate.com, Slate.com, MotherJones.com, and NPR online. Tickets can be purchased in advance through GuestList.com:https://guestlistapp.com/events/312456, or at the door on February 19. Admission is free for members of the Cartoon Art Museum. The Cartoon Art Museum and the Association of American Editorial Cartoonists present Slinging Satire, a showcase of recent comics by today’s top political cartoonists. Featured artists include Pulitzer Prize winners Mark Fiore, David Horsey, and Kevin Siers; Herblock Award winners Matt Bors, Jen Sorensen, Tom Tomorrow and Matt Wuerker; and a host of cartoonists from the publishing industry’s most prominent newspapers, websites, and magazines. The cartoonists included in this exhibition span the political spectrum from bleeding-heart liberals to staunch conservatives. Some draw cartoons using traditional tools, like pen and ink, to be featured in their daily newspaper. Some create works with cutting edge digital tools, solely for online venues. And some artists forego static images altogether, creating original animated cartoons to express their political opinions. From veteran creators to today’s cutting edge innovators, we invite you to explore the power and fun of visual satire. 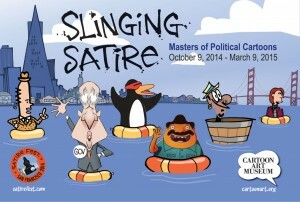 If you live in the Bay Area, please join our friends at the Cartoon Art Museum this Thursday for a discussion about satire featuring some of the biggest names in political cartooning. Current CBLDF members get a discount at the door!